Freshman student, Caio Moraes, had the opportunity to run the field at the Georgia State Panthers first football game of the season. Freshmen in the class of 2019 had the opportunity to take the field with the football team in the season opener against the Charlotte 49ers on Sept. 4. This is the first year this unique experience has been put into place. Although, the Panthers were unable to pull out the victory in the home opener against the 49ers, the freshmen for this year had an experience they’ll never forget. 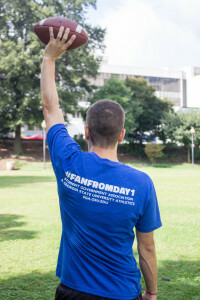 The Student Government Association (SGA) partnered up with Georgia State Athletics to allow the first 500 pre-registered freshmen take the field with the Georgia State football team. During the players pre-game warm up, students were allowed to stand on the sidelines of the Georgia Dome and watch the team go through pre-game rituals. Closer to game-time, the 500 freshmen were asked to move into the tunnel with the players. FanFromDay1 participants were given a free T-shirt that had FanFromDay1 on the back of the shirt. Moraes believes the energy and adrenaline through his body was something he has never had a chance to feel. “This was my first stadium football experience at all, college or professionally,” Moraes said. The Kinesiology & Health major says he will always remember his first experience at a sporting event as a college student. Moraes referred to the buses because Georgia State’s buses will transport students for free from campus to the Georgia Dome and bring them back following the game. “A thought it was well-organized, like the announcements and the advertisements. I really liked the free buses and things like that,” Moraes said. He believes this is the start of something that will become a tradition and help students engage more into the program. “Of course, everybody should try it. They should have the chance to run on the field and have an opportunity to be a part of it,” Moraes said.